I like noodles, just the way I like rice. 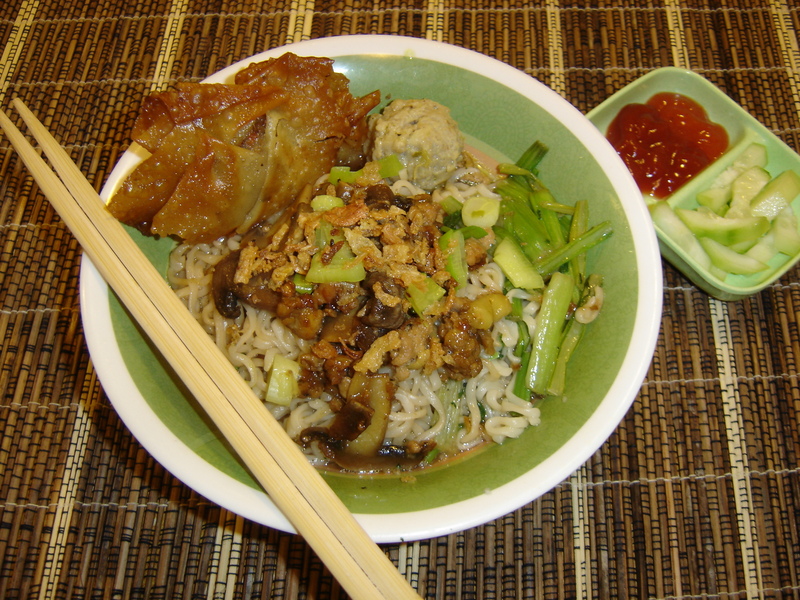 This Mie Ayam Bakwan is another way of cooking noodles with Chicken and mushroom. If you want to have an alternative meal, this can be an option. It’s delicious, yet easy to make. 1. Heat the oil and sauté the Chicken for couple of minutes. 2. Then add the mushroom, chicken stock, chicken bouillon and sweet soy sauce (kecap manis). Stir them well. Let it shimmer until it’s almost dry. 3. Make the garlic oil: heat the oil, then add the garlic and fry it until slightly brown. Don’t over burn it! Then add the soy sauce (kecap asin), and water. Continue cooking until it’s boiling. 4. Set a plate/bowl with 1 teaspoon of sesame oil, 2 tablespoons of garlic oil, salt and pepper. Put the cooked noodle into a plate and mix thoroughly. Then add green salad or cooked Choy Sum if you like. Give 3 tablespoons of chicken mushroom, meatballs, cucumber pickles and fried meatball. Garnish with spring onion and fried shallot. Add chilli sauce if you like it spicy.